﻿ Psalm 143:8 Let me hear Your lovingkindness in the morning; For I trust in You; Teach me the way in which I should walk; For to You I lift up my soul. Let me experience Your faithful love in the morning, for I trust in You. Reveal to me the way I should go, because I long for You. In the morning let me hear of your gracious love, for in you I trust. Cause me to know the way I should take, because I have set my hope on you. 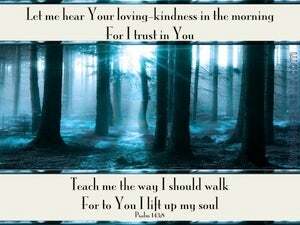 Cause me to hear thy loving kindness in the morning, for in thee do I trust. 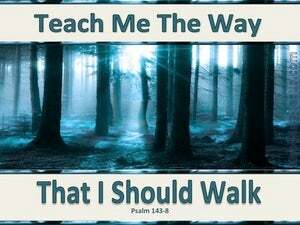 Cause me to know the way in which I should walk, for I lift up my soul to thee. Cause me to hear thy loving-kindness in the morning, for in thee do I confide; make me to know the way wherein I should walk, for unto thee do I lift up my soul. Cause me to hear thy mercy in the morning, for in thee do I trust; cause me to know the way in which I should walk, for I lift up my soul unto thee. Cause me to hear thy mercy in the morning; for in thee I trusted: cause me to know the way that I shall go; for to thee I lifted up my soul. Cause me to hear your lovingkindness in the morning; for in you do I trust: cause me to know the way in which I should walk; for I lift up my soul unto you. Cause me to hear your loyal love in the morning, for I trust you. Cause me to know the way that I should go, for I lift up my soul to you. Cause me to hear Your loving-kindness in the morning, for I do trust in You; cause me to know the way in which I should walk, for I lift up my soul to You. 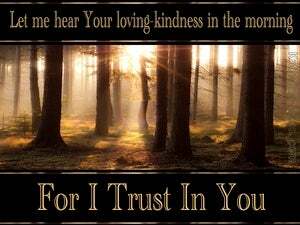 O let me hear thy loving-kindness betimes in the morning; for in thee is my trust. Show thou me the way that I should walk in; for I lift up my soul unto thee. May I hear about your loyal love in the morning, for I trust in you. Show me the way I should go, because I long for you. Cause me to hear thy loving-kindness in the morning; for in thee do I trust: cause me to know the way in which I should walk; for I lift up my soul to thee. Cause me to hear in the morning Thy kindness, For in Thee I have trusted, Cause me to know the way that I go, For unto Thee I have lifted up my soul.